“Game with an intent to educate” – almost sounds like a crime, doesn’t it? And usually they are criminal, because whoever designed them did so as “game with an intent to educate”. But that’s not the only way to do it, there could be a “game with an intent to educate“, and then people might actually play it voluntarily and be educated in the process. Granted, CO2 is not an in-depth education game, but it does have some important things to say on the subject of climate change and our increasing hunger for energy. And one point that CO2 makes very eloquently is that, with too much CO2 in the atmosphere, we’re all screwed: around half of the board runs a big counter for the stuff, and if atmospheric CO2 ever reaches 500 ppm, all players lose the game. And we all face global disaster, coincidentally. However, that’s not all that hard to prevent – I actually would have preferred if it was a bit harder to save the world – by simply building enough green power plants. That’s what you do in CO2: run a multinational energy company and build green power plants all over the world: solar, biomass, recycling, nuclear and reforestation – the latter not being a power plant per se, but an important part of the fight against global warming, so it gets to be included. And yes, if we’re only talking about CO2 then nuclear may be considered green. In game terms, there is no difference between the different types of plants except the price to construct them. That’s still a bit in the future, though, because getting a power plant up and running is done in three steps. First, you have to propose a project to the regional authorities – just for convenience, that’s Asia, Oceania, Africa, Europe and North and South America. To propose a project, it has to fit the energy agenda for that region, the set of three energy sources drawn before the game starts that this region has committed to invest in. No real work has been done yet, you’re just coming up with the rough plans, but already you can take a profit from it: your choice of either two Tech Resource Cubes, a new scientist to join your employ, or one coin for each Carbon Emission Permit (CEP) the region currently has. Trading with CEPs is a part of CO2, but they are simply another currency, completely unlike the real world where they are more like an elaborate scheme for rich companies to profit at the expense of poor countries while pretending to give a rat’s arse about the environment. Sorry about the digression, but I have some strong feelings on that subject. In game, everything is much better. Step two to having a shiny, new power plant: installing the project. Plans must be drawn, officials bribed for the permit, inhabitants of the area driven out of their houses – just because it’s green doesn’t mean it’s nice. Actually, there’s none of that even implied, installing a project is simply another action you take and take a profit for, this time depending on the type of power plant. Only after a project has been proposed and installed can you construct a plant. Where the first two actions bring in a profit, constructing is sort of expensive and paid for in coin and tech resources. But doing so gives you a whole lot of victory points. Well, you or whoever constructs it in the end, because that’s the interesting part of building power plants in three steps: a project doesn’t belong to anyone. You may have proposed a project, but anyone else can install it. And someone else yet again can construct it. Only the finished plant has an owner, and whoever builds it in the end keeps it. Building power plants in three stages makes for interesting player interaction. There is a predatory aspect to it, where you just wait for another player to take an action so you can swoop in and take the next step. Especially in the end stages of the game, there tend to be a bunch of proposed projects that no one wants to install because then they won’t be the ones to construct it and take the points. But there is another, almost cooperative aspect to it: you want to get one plant built per region per decade (game round) because if you don’t the region will build itself a shiny, new, disgusting, polluting, fossil power plant to satisfy its energy needs. Every such power plant will add to the CO2 levels, and that’s a very, very bad thing: too much waiting for the others to act first will put a very quick end to the game for everyone. 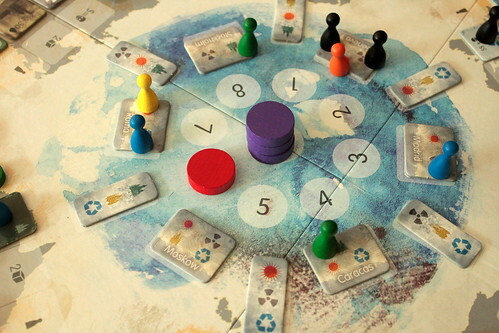 The forced cooperation part is especially strong with five players because you get fewer actions per decade the more players are in the game; with five players, you only get two actions, so it’s impossible to construct a power plant on your own. Depending on your tastes, that might make five players the ideal for CO2 or no fun at all. Here at the Meople Cave, we enjoyed it a lot. Creating energy for the world is not the only thing to do in CO2: there is science to be done as well. Whenever you propose or install a project – or when you just happen to find an unstaffed project lying around – you can send one of your scientists there to do research to it. Every turn, you gain a point of expertise in one energy source your scientists are working on. Expertise is needed to ever be able to construct a power plant – but the requirements for that are low. Expertise beyond that basic level comes with some rather neat benefits, though: advancing on the expertise track can give you tech resources, add CEPs to any region or even give you extra expertise in another type of energy. The best thing to come from expertise, though, is income. At the start of every new decade, the first two players on every expertise track get income based on how advanced they are. This income is, potentially, you’re primary source of money – although good things can be said about trading on the CEP market sometimes – but there is a trick to it as well: when you take income, you choose how to split it between money and victory points. Money is nice, of course, but taking less coins and more points early in the game can end up making a difference. All those things change every game, making sure you won’t find a cookie cutter strategy to win at CO2. Except if you consider “only playing against first timers” a strategy, because you’ll need a game or two before you really know what’s going on. It’s not a hugely complicated game, but you won’t get it from the start, either. But trust me when I say: it’s worth spending the time to understand it. 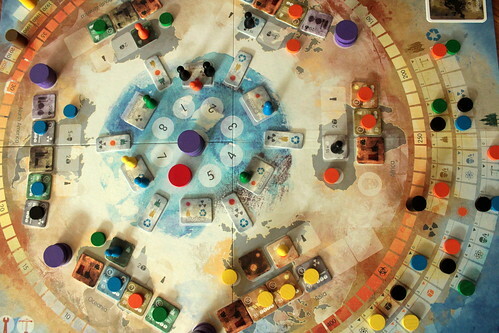 CO2 is a game that takes a rather dry subject and builds a very enjoyable game around it. 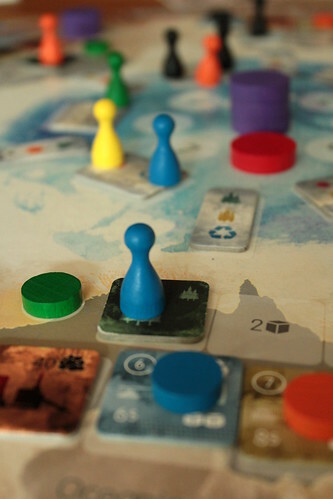 A game that plays out differently every time, that requires strategic thinking and lets you try different ways to victory and that is much more interactive than it looks from reading the rules – there’s no direct interaction like trading, but everything you has an effect on the other players, and it pays to always keep an eye on their resources before you act. That’s a lot of plusses already, but the most surprising plus is how good CO2 looks. It looks seriously good. I don’t mean it looks good for a game about a dry subject, I mean it’s one the prettiest we saw in Essen last year. Paula Simonetti and Giacomo Tappainer did outstanding work here. Seems I really have to think hard to find anything bad to say about CO2 at all – so how about this: it’s not all that educational in the end, only a little. And it could be slightly less forgiving with the CO2 levels. But you can tell I really had to look for something to complain.